Irish based street artist Asbestos has just dropped a new print. 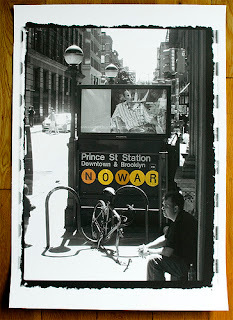 The "NO WAR Print" features a photo of a street intervention in New York in June 2004. The stickers for the N Q & R lines had an O,A and R hand cut vinyl sticker added to the Prince St Station sign.